Mobile eyebrows allowed humans to communicate non-verbally, which helped to form large, social networks. The ability to raise an eyebrow in distrust or to furrow it in sympathy may have given our species an evolutionary edge, researchers in Britain said Monday. Highly mobile eyebrows gave humans non-verbal communication skills required to establish large, social networks which allowed for greater cooperation and better survival odds, they said. "Eyebrows are the missing part of the puzzle of how modern humans managed to get on so much better with each other than other now-extinct hominins," said Penny Spikins from the University of York, co-author of a study published in the journal Nature Ecology & Evolution. Spikins and a team examined the function of pronounced, bony brow ridges in our early ancestors, and to understand why we shed them over time. Some research had suggested that a large brow ridge helped protect our forebears' skulls from damage resulting from forceful chewing, or that it filled a void between the brain case and eye sockets. 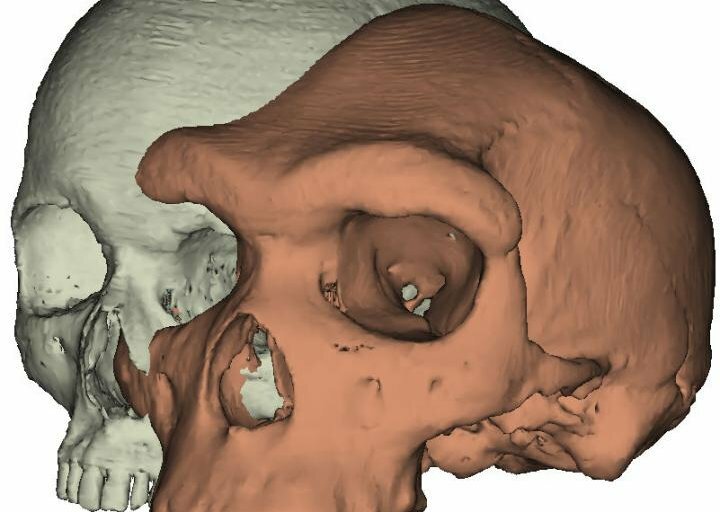 The team used 3D engineering software to examine the brow ridge on a fossilized skull of Homo heidelbergensis, an archaic member of the hominin family comprising modern humans and our direct, extinct ancestors. Home heidelbergensis, which lived between 600,000 and 200,000 years ago, is thought to be the common ancestor of humans and our Neanderthal cousins. The researchers digitally recreated the skull, held in the collection of the Natural History Museum in London, and experimented with changing the brow ridge size while applying different biting pressures. They found that a large brow ridge does little to relieve pressure on the skull when eating. Also, it was much larger than needed to fill the gap between H. heidelbergensis' flat brain case and eye sockets. In our extinct ancestors, prominent brows may have signaled social status or aggression, later giving way to the more expressive eyebrows of modern humans, said the team. The development of a smooth forehead with more visible, hairy eyebrows capable of greater movement, began in hominins around 200,000 years ago and has accelerated over the past 20,000 years. "Social signaling is a convincing explanation for the jutting brows of our ancestors," said Paul O'Higgins, senior author of the paper and anatomy professor at the University of York. Eyebrow movements allow humans to express complex emotions and perceive those of others, said Spikins. A rapid eyebrow flash is a cross-cultural sign of recognition, while lifting our eyebrows in middle signals sympathy. Small movements could signal either trustworthiness or deception. "On the flip side, it has been shown that people who have had botox which limits eyebrow movement are less able to emphasize and identify with emotions of others."